The 2016 Destination D convention happened on November 19th and 20th, and Magic & Misadventures was there! Throughout this post, and the next, I will be breaking down the presentations and events that we had the opportunity to see over the weekend. Before we get to day one, though, there was… day zero-point-five, I guess we could call it. On Friday, November 18th, we went over to the Contemporary Resort (where Destination D is held) to register so we wouldn’t have to deal with doing that on the first morning of the convention. There was virtually no wait at the registration counter when we arrived that afternoon, and the actual act of registering only took us a few minutes. There looked to be slightly longer lines later in the day and the next morning, though even those seemed to be moving fairly quickly. 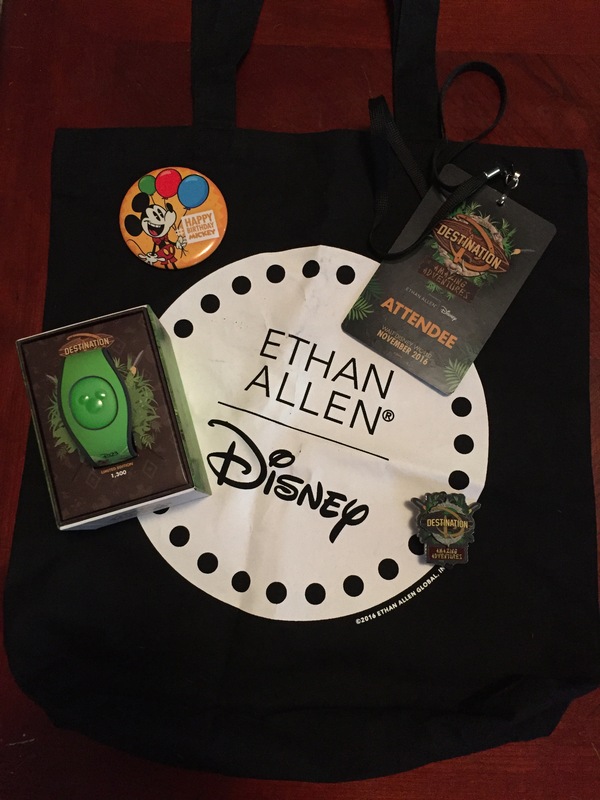 Contents of the swag bag included: a Destination D pin, a “happy birthday Mickey” button that they had been giving out in the parks, and a special Destination D-themed MagicBand 2.0. The MagicBand 2.0, which is slated to release for annual passholders in December and in January for regular guests, was given to attendees. Additionally, there was a display case of other styles as well as cast members on hand to talk about the new design and show off its features. Check out the photos and video on the Magic & Misadventures Facebook page to see more. We also took this opportunity to check out the great exhibit set up by the Disney Archives, which featured photos and items from Walt Disney’s real-life adventures around the world. That was very cool to see, and it really showcased how these trips influenced so many aspects of the Disney parks. We stopped briefly outside of the exhibit to look at the art and photo reprints they had for sale. Incidentally, Imagineer Joe Rohde was standing RIGHT BEHIND US but we didn’t want to bother him so we didn’t say anything. He was totally like three feet away from us, though. The Disney Archives exhibit was a very cool look at Walt’s travels, with photos and items from his trips. We then wandered over to the Mickey’s of Glendale “pop-up” shop, but it wasn’t open yet and a pretty long (like two hour long) line had already formed. In addition to Destination D and Imagineering merchandise, they were selling limited exclusive pins that many people were very excited for. It seemed likely that most of the people in line were actually waiting for those pins, and since we didn’t really care about them ourselves we opted to leave and try again. We had dinner reservations at the Contemporary later in the day anyway, so we figured that we’d try again when we came back later. Before heading out, though, we headed to the Contempo Cafe (the quick service eatery at the Contemporary) for lunch. There, we ran into and chatted with John from BigFatPanda.com. This was one of the reasons we were really looking forward to Destination D–the chance to interact with other Disney fans and particularly other Disney bloggers/press. This is Robert Lisinksy, a visual artist and fellow Destination D attendee. 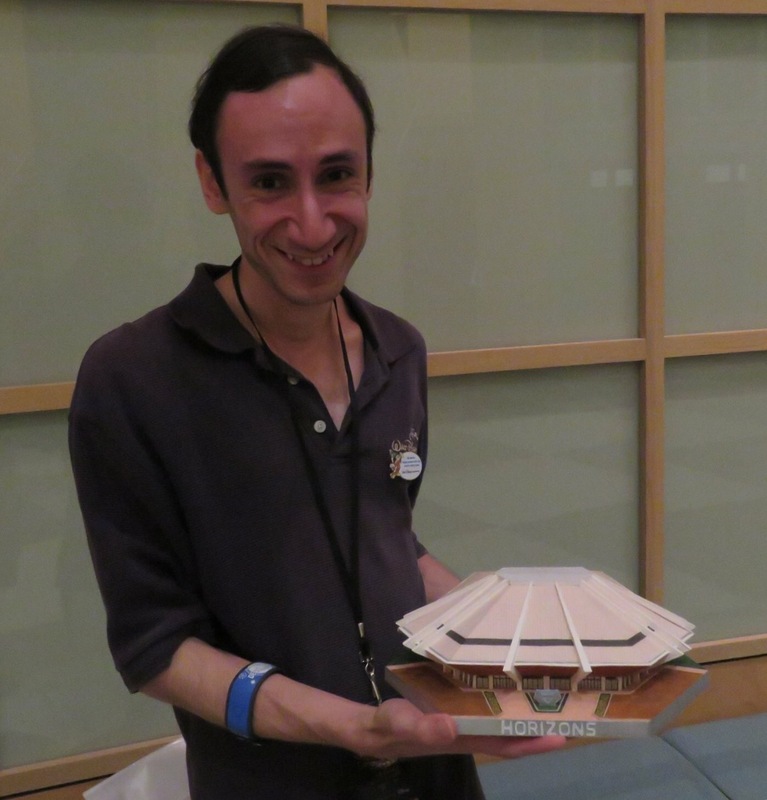 He overheard a conversation I had with someone about EPCOT Center, and stopped me later to show me this papercraft Horizons model that he had made. The model actually splits open to reveal “if we can dream it, we can do it” on one side and Mesa Verde on the other–which can be swapped out with Seabase Alpha. It was a very cool piece, and it was great to meet a fellow Horizons fan. We took advantage of the beautiful afternoon and went back to the Grand Floridian to lounge in the pool for a bit. We did make it back to Mickey’s of Glendale later that evening (around five o’clock or so) and the line was considerably shorter. There was a separate queue for those exclusive pins that still looked to be pretty long, but there was no wait to shop for other items. We proceeded to spend a fair bit on exclusive Walt Disney Imagineering clothing items. We then found ourselves with a fair amount of time before dinner, so we did actually wait in line to check out the pins (partially because friend and former Imagineer Brian Collins had asked me to look for a certain pin), though we didn’t end up purchasing any of them. The next morning we, along with hundreds of other Disney fans, collected in the Contemporary’s Fantasia Ballroom for the first day of Destination D! 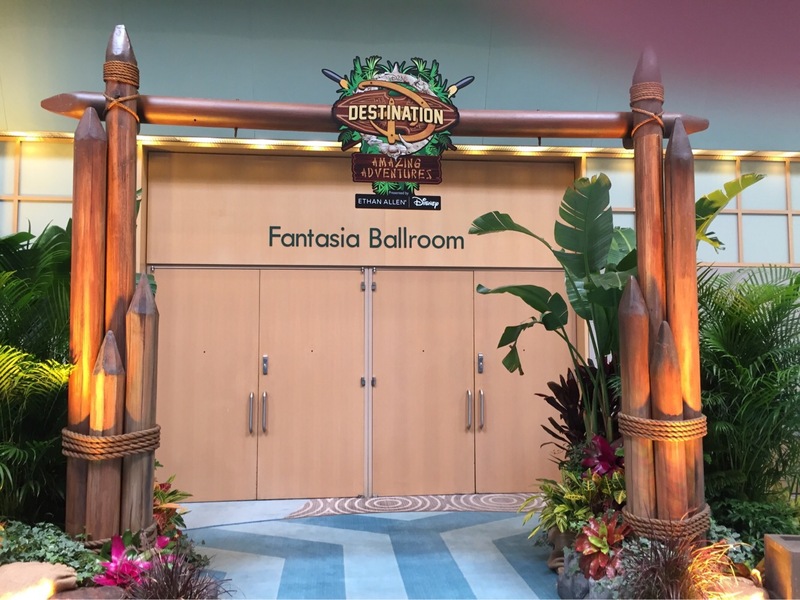 The entry to the Fantasia Ballroom was decked out in the “adventure” theme of the event. We got there early enough to check out the room (the convention kicked off at 9:00am, and we got there around 8:30am). There were adventure-themed photo op backdrops set up in the back, and in one corner the new Ethan Allen line of Disney furniture was on display. Aside from an area reserved for press and the front couple rows that were earmarked for the (very expensive) VIP ticket holders, it was open seating, so we picked chairs and soon things were underway. There were a lot of people there, but we were easily able to find good seats and it didn’t look like the room was actually at capacity. 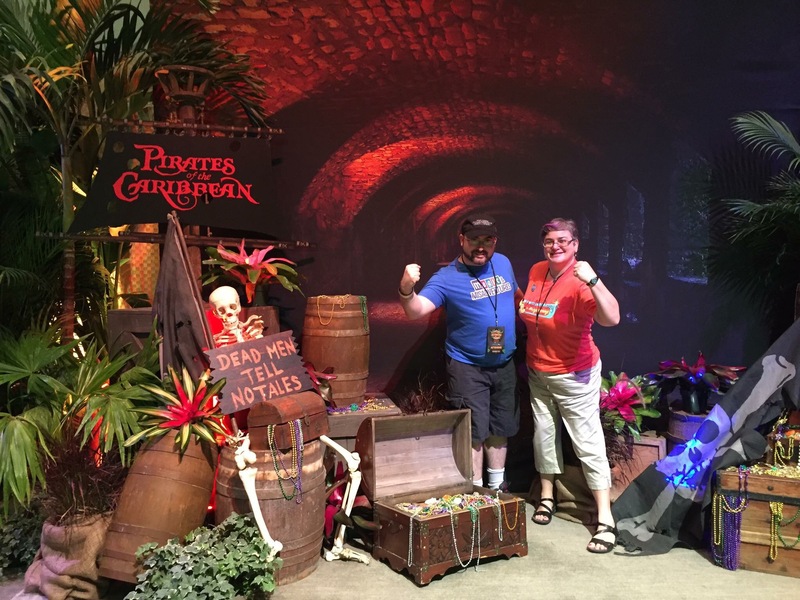 At the back of the conference room were dioramas, like this Pirates of the Caribbean one, which was perfect for adventure-themed photos. A short video about “adventure” started things off, and then our host for the weekend took the stage. Dressed in a khaki jungle explorer outfit and pith helmet, with a neat beard and curled mustache, Dr. Albert Falls (who, of course, Schweitzer Falls in the Jungle Cruise is named after) introduced himself and welcomed guests to Destination D. He would reappear to introduce almost every presentation over the next two days and make announcements, and he was really a lot of fun. Kudos to the performer they picked to bring this character to life. Personally, I’d love to see Dr. Falls appear in the parks around the Jungle Cruise as a walk-around character. He introduced D23 chairman Michael Vargo, who thanked everyone for coming and stated that the attendees for Destination D came from thirty-nine different states and from eight different countries! He brought up other D23 staff members as well, who talked about some of the different D23 events that we’ll be seeing over the course of the next year. Like the EPCOT 35th anniversary party in the Fall of 2017 that I really want to attend but probably won’t be able to. Then, Walt Disney Parks and Resorts chairman Bob Chapek came onstage and sat down for a talk with D23’s Jeffrey Epstein. One of the first things he said was to announce that Pandora-World of Avatar will be opening at Animal Kingdom in the Summer of 2017! He went on to talk a bit more about the project, explaining that there would be two attractions: a slow boat ride through the jungles of Pandora, and a thrill ride in which guests would “fly” on a Banshee creature from the movie. He then moved on to Marvel news, touching briefly upon the Iron Man attraction at Hong Kong Disneyland and then stating that while Guardians of the Galaxy is replacing Tower of Terror in Disney’s California Adventure, the attraction is remaining as it is at Hollywood Studios. He mentioned Star Wars Land briefly, but other than showing a new piece of concept art there wasn’t much by way of new information. He did, however, state that Star Tours would be refreshed with new content as new Star Wars movies get released (though he said that this means the numbered films like the upcoming Episode VIII, and not Rogue One). Chapek then spoke about EPCOT, and admittedly this was something I was dreading. I had heard rumors about what may be closing and what could be coming in, and I feared that this was when all those rumors turned into truths. While he didn’t go into specific details, and he didn’t necessarily confirm or deny anything, he did state that EPCOT will be undergoing a “major transformation” in the future. He explained that there were points that they intended to hit in this, including making it: more Disney, more relevant, timeless, more family oriented, and true to the original vision. He didn’t really explain much about what any of those meant, nor did he give any sort of timeframe or concept for this. He moved on to talk about how they were focusing on the guest experience at the parks, and how they wanted to bring Disney Magic to every aspect of a vacation–from the resorts to transportation to the parks themselves. He said that they were working hard on “personalizing” the Disney experience, and we’ve already seen some of that come to fruition with the connecting of MagicBands to certain attractions. He also teased that the Society of Explorers and Adventurers (of which Dr. Albert Falls, as well as Dr. Henry Mystic from Hong Kong Disneyland, are members) would be getting a bigger role in the parks. There’s a bit of this already happening in the new Skipper Canteen restaurant in Walt Disney World’s Magic Kingdom, and I’m excited to see this story–and hopefully the characters–get used a lot more. After Bob Chapek’s presentation, movie producer Don Hahn (Beauty and the Beast, Lion King, and a bunch of others. Including one of my fave bad movies, The Haunted Mansion) and Becky Cline (director of the Disney Archives) came onstage to do a presentation about Walt Disney’s “True-Life Adventures” nature documentaries. They showed clips and talked about the production of the movies, which led into the more recent DisneyNature series (which Don produces). Learning how the crews past and present captured this footage–which often took weeks of waiting for a minute of film–was very interesting. They then showed a new clip of the next DisneyNature film Born In China, that’s being released on Earth Day 2017. Don Hahn in particular proved to be a hilarious presenter, with a deadpan delivery of comments that really had the crowd laughing hard. To be fair, the content itself lent itself to such commentary (if you ever cross paths with a Destination D 2016 attendee, ask them about the throwing of ducks) and it was a really fun presentation overall. The newer DisneyNature footage, including the new Born In China stuff, was simply breathtaking to watch. The next presentation opened with a video of Walt Disney talking about the original Adventureland, and then legendary Disney Imagineer Marty Sklar came up to talk. He shared photos of original Imagineers taken during the construction of Disneyland, plus a rare photo of Walt himself standing in Adventureland chatting with guests. These photos were accompanied by his own commentary of what was happening in the photos, and anecdotes about the creation of the parks and the people involved. He showed and talked about original Harper Goff concept art for Adventureland, the 20,000 Leagues Under the Sea film, and the Jungle Cruise attraction. He talked about Bill Evans, the landscape designer for Disneyland and Walt Disney World, and then showed a short video of Bill on the Jungle Cruise talking about the different plants that were used on the ride. In all honesty, getting to hear Marty Sklar talk in person was one of the big reasons we were excited to be at the convention, and his presentation did not disappoint. Getting to see these photos and listen to his stories was an incredible experience. After Marty Sklar’s presentation was a two-hour break. We hopped on a monorail and went to the Polynesian Resort for lunch, as the Contempo Café at the Contemporary (their quick service eatery) was packed. The Polynesian was busy as well, but it wasn’t nearly as bad. Plus, as it was a beautiful day, it was nice to sit outside for a bit after spending the morning in the conference room. There was a pop-up food service in a nearby room for the convention, but the line was really long during each break so we never checked out what they had to offer. When the convention resumed, representatives from Walt Disney Studios Home Entertainment came onstage with a special announcement: Pinocchio is coming to blu-ray in January as a Signature Edition release. Like the previous Signature Editions, this means that it’ll be packed with behind-the-scenes extras. To celebrate this announcement, they also gave each attendee a special Pinocchio lithograph. After that brief announcement, the next presentation featured Disney legend/Imagineer/former senior VP of creative development Tony Baxter as well as Imagineers Jason Grandt and Luc Mayrand, talking about the different Adventurelands at the Disney parks around the world. They shared photos and anecdotes, including a lot of information about the new Adventureland in Shanghai. Honestly, getting the chance to hear Tony Baxter talk in person was another big reason we were stoked to attend Destination D. He started as an ice-cream scooper at Disneyland in 1965 and became an icon, responsible for overseeing attractions such as Big Thunder Mountain and Star Tours, and both my wife and I are pretty big fans of his. The next presentation, though, was one of the surprise highlights of the weekend. Called “Tales from the Jungle Cruise”, it featured a panel of Imagineers, former Jungle Cruise skippers, and Disney historians. Obviously, the presentation was full of humor and puns as the group (Justin Arthur, Kevin Lively, Alex Grayman, Wyatt Winter, Trevor Van Dahm, and Chris Merritt) talked about their own experiences as well as the history of the attraction. They shared stories about funny moments they had encountered, showed photos, talked about Marc Davis’s contributions to the creation of the ride, and more. They also spent some time talking about Skipper Canteen, the new Jungle Cruise-themed restaurant in Walt Disney World’s Adventureland. When my wife and I saw the original schedule we figured that this would be a fun one (it was about the Jungle Cruise, after all) but it was even more entertaining than we had envisioned. Also, we were all inducted into the Adventurers Club (part of the Society of Explorers and Adventurers). We had to recite an oath and everything. Truth be told, we love goofy moments like that and we even went back to Mickey’s of Glendale and bought an SEA pin the next day to commemorate that moment. Don Hahn then briefly returned to the stage, and (after some hilarious set-up) showed the original theatrical trailer for The Swiss Family Robinson. This would end up being a recurring bit throughout the weekend, as he would return to the stage a couple more times to show more trailers for different Disney live-action movies. Disney artists Casey Jones and Richard Terpstra, as well as Steven Vagnini from D23, then presented a look at Disney’s Polynesian Resort. They showed photos and artwork as they took us through the history of the resort, from its opening in 1971 to the recent renovations. They then invited Auntie Kau’i, an original Polynesian Resort cast member, to the stage. She talked a bit about her own childhood (growing up not far from Pearl Harbor, and recalling the day of the bombing) and her time at the Polynesian Resort. Towards the end of the presentation, she was joined by fellow Polynesian cast members Ku’ulei and Kalei, and the three of them encouraged the entire audience to stand and dance as they offered us a brief lesson in the hula. The final presentation of the day was by Jared Bush, screenwriter for Moana. He detailed the writing process, discussed many of the ideas that made it in and some that didn’t, and showed lots of exclusive clips of the (at the time) upcoming film. He also talked about how they tried very hard to embrace and respect the culture that they were representing in the film, and talked about their research trips and the incorporation of the legends that became a part of Moana‘s story. This led into a detailed explanation about the start of the Oceanic Trust, the group that was formed to make sure that the production offered an accurate and respectful representation of South Pacific culture. Finally, Michael Vargo and some of the D23 team came back up to end the day’s presentations and also to give us information about the nighttime event that we were all invited to: watching Moana on the beach at the Polynesian Resort! We rushed back to Port Orleans to get changed (we had changed resorts, from the Grand Floridian to Port Orleans, which is a longer tale that I won’t get into here) and grab a quick bite to eat, and then we headed over to the Polynesian Resort where we were directed to the beach by cast members. We were offered a bag of popcorn–which also had dried fruit, nuts, and possibly some other tasty snack things in there–and a drink, and then we settled into our seats in chairs on the sand. Jared Bush and a few others–including Disney Park Blog livestream host Mark Daniel and a Moana face character–came up onto a small stage and talked, and then we watched the movie. It was a great film, and we had been looking forward to seeing it, and getting the chance to do so a few days before release–and at the Polynesian Resort–was just a cool experience. After the movie we were invited to stay on the beach to watch Wishes (Magic Kingdom’s fireworks show) from across the water. They even piped in the music from the show. Then, we headed back to our room. We were exhausted, but full of great information and still thrilled from the experience. It wouldn’t be long before we’d be back at the Contemporary for day two!